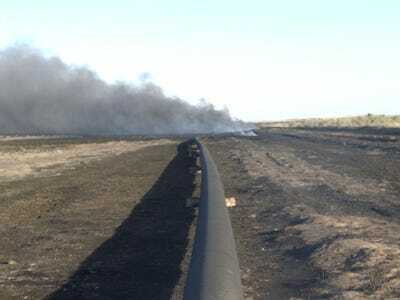 There has been a massive explosion at a natural gas plant in the Sinai desert, along the pipeline from Egypt to Israel and Jordan, according to Global Post. The state-run Middle East News Agency blamed “subversive elements” for the explosion. The attack was likely carried out by Beduoin armed with rocket-propelled grenades, who carried out a confirmed attack on a security headquarters in the area, according to the WSJ. The pipeline transmits over one quarter of Israel’s natural gas supply and was the basis of an alliance between the two countries since 1979. In 2005, Israel signed a 15-year contract eventually worth 1 trillion cubic feet — nearly all of Israel’s natural gas supply by 2014. Supplies have been disrupted because of the attack, but will be resumed soon, according to the WSJ. But the pipeline remains vulnerable — especially if the same people who attacked it come to power after Mubarak.